In the days of my youth, when my bedtime prayers including a request to be given superpowers (I swear to God, I'm not making that up), I bought a few hundred Marvel comics and read them all like they were the Holy Scriptures. This one, like all the others, was definitely the Gospel according to Stan Lee. 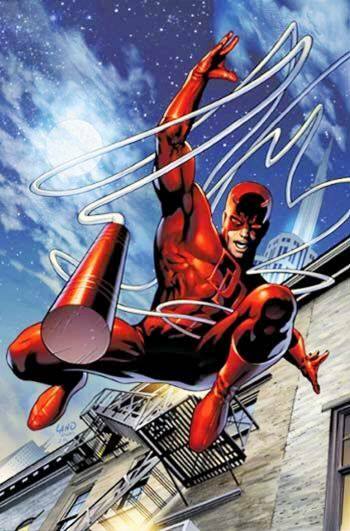 Ya gotta love a superhero who fights crime by night in a bright red costume, swinging from building to building with a cable he shoots out from his club with hook on the end — which looks suspiciously like a short version the cane he carries around during the day because he's blind. And that brings up his unique secret identify as a noble attorney who fights crime in the daytime wearing a business suit, using the power of the judicial system to defend clients who are falsely accused. 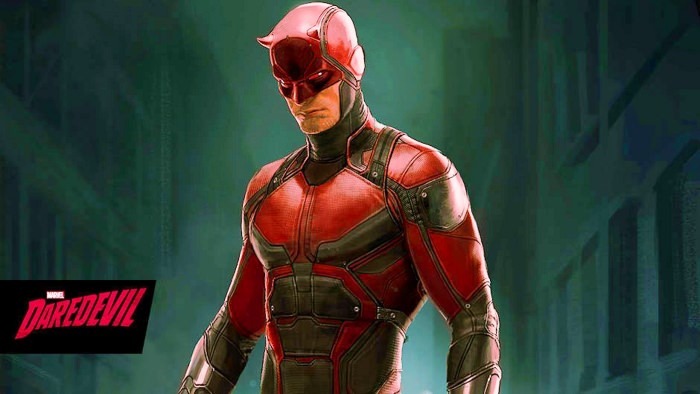 I'm delighted that this Netflix original series is doing such a stellar job of finally bringing this unique Marvel superhero to the screen. 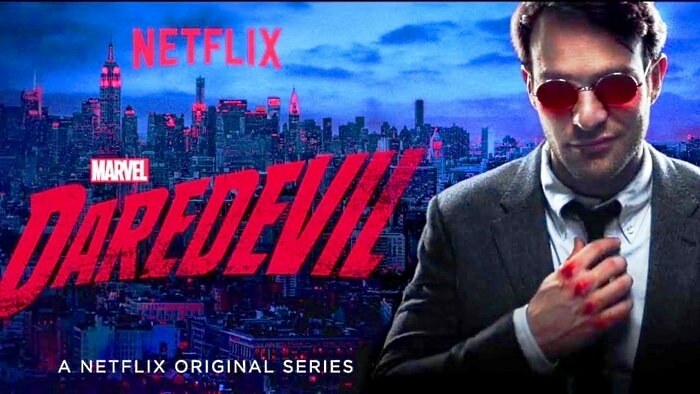 I just watched the 2nd episode of Daredevil and I love it! There's a fight scene at the end in which our hero rescues a kidnapped boy after he beats the ever-lovin' crap out of eight guys in the hallway of a rundown tenement building . . . despite the fact that the episode begins with him lying inside a back-alley dumpster, severely wounded from a beating and a life-threatening knife wound! 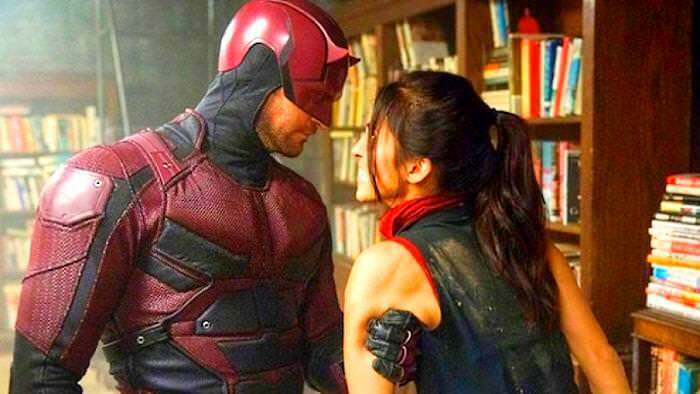 The fight at the end occurs just a few hours later, and Daredevil (Charlie Cox) mixes the savage fight scenes with brief moments in which he has to pause for a moment because of the pain he's suffering from the injuries we saw at the the beginning of the episode! This was a prime example of a true super hero. What also impressed me was the fact that the entire fight scene actually appears to have been filmed in one continuous shot — despite the flawless and complex stunt choreography which lasted for almost two full minutes! And if that isn't enough to impress film fans, the camera started shooting at one end of the hallway and slowly moved closer and closer to the action until it passes an open door which DD and several of the men crashed through, causing them to pass out of sight. For several seconds we hear the fight raging on inside the room while a few men (and several random pieces of furniture) explode through the open doorway and out into the hall! Then the camera turns around and continues to cover the fight from the opposite direction as DD and the few men who aren't already unconscious explode back out into the hallway. Finally DD beats the last man into unconsciousness and stumbles wearily down the hallway to a room at the end, where we hear him reassuring the kidnapped boy that he is safe. DD emerges seconds later, holding the rescued boy in his arms. It's a moment that would make career Marine sergeants weep. Hot damn, this series is magnificent! I'm looking forward to watching all of it, several episodes each day! I'm so glad you've joined the NETFLIX mafia Bud! This series is outstanding! You look like you're just into the beginning of season one. Two picks up with a vengeance and is even better! From there skip over to THE DEFENDERS and see Mat Murdock working with IRON FIST, JESSICA JONES and POWERMAN, LUKE CAGE, eventually to be joined by THE PUNISHER. Some GREAT stuff can be found on this channel! 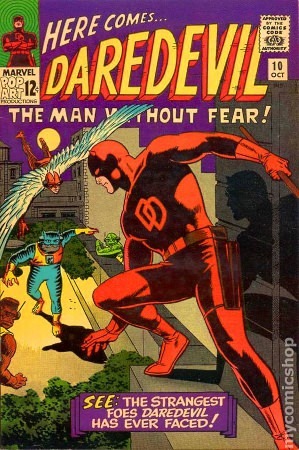 I think my first encounter with the Man Without Fear must have been the 1967 Lancer paperback, Here Comes Daredevil, which reprinted, generally sideways, issues 1, 3, and 17, in black and white. US paperbacks turned up regularly in our local branches of Woolworths, among the remainders they sold at about the third of the normal cover price - 1 shilling and 3 pence. Doing an image search, it seems to be a regular on auction sites these days, for twenty bucks or so if you're not too fussy about condition. 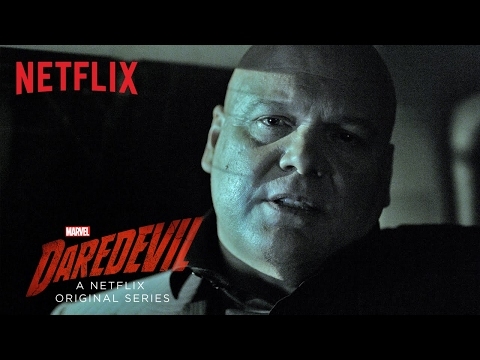 Anyway, Bud, welcome to to the Marvel Netflix Universe... there are occasional references to the Marvel movies, but generally the characters involved are busy in their own New York. With no Stan Lee cameos, unless you count a printed photo in the background, unlike Agents of SHIELD! I watched the first few episodes recently on Netflix and then sort of forgot about it. I'll have to get back into it, because I enjoyed it, and you folks have recommended it. In fact . . . I'll do that right now! <--- note the Daredevil emoticon. 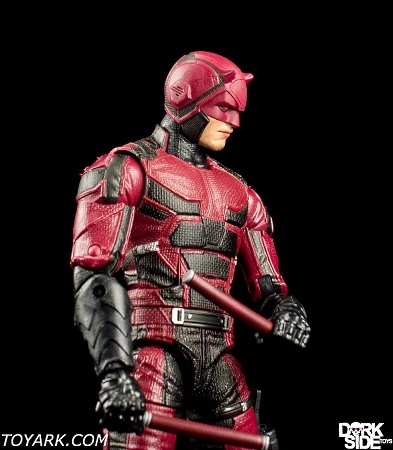 I finished season one of Daredevil today and got my first look at his awesome costume! 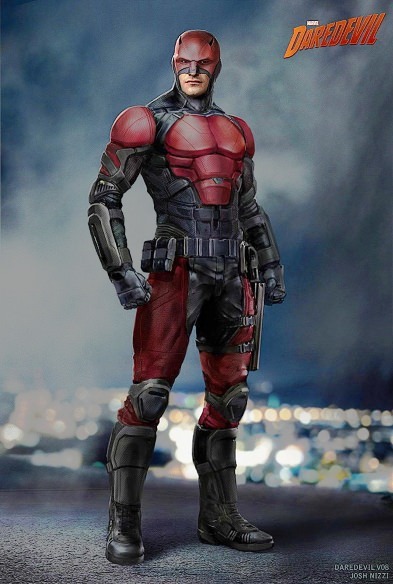 THIS a proper outfit for a superhero — well armored and not overly colorful, with holsters for his fighting sticks. I noticed in a few closeups that the mask has shiny dark red "lenses" which either reflect small highlights (or have little white dots). 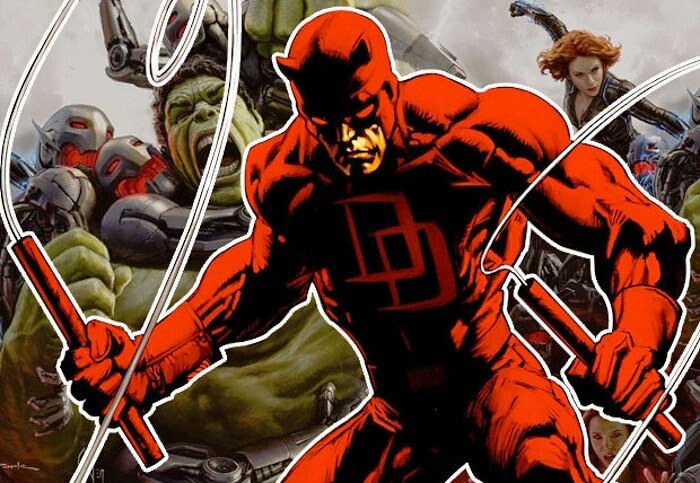 It makes it look like Daredevil has eyes — which is smart, because somebody might eventually connect the "blind superhero" with the "blind lawyer" and figure out who is really whom. The helmet is a bit different in the picture. I'm hoping that the series will eventually incorporate the line he uses to swing around the city. If anybody wants to let me know if that happens in season two, I won't cry "spoiler!" By the way, I could have sworn the stick at the end of the line had a hook on it resembling the end of a cane. But I couldn't find a single comic book cover that showed that. In fact, many of the covers show straight sticks connected to both ends of the line. 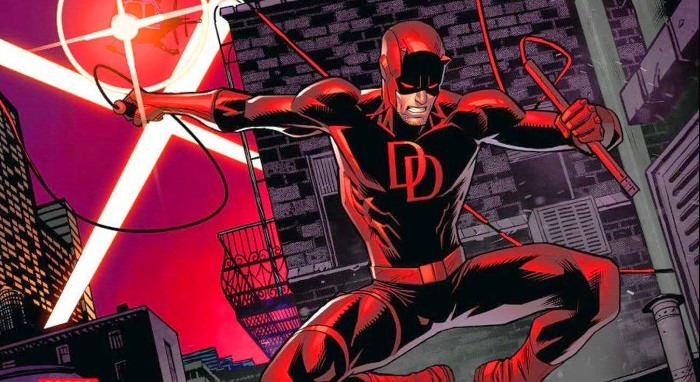 So, I have to wonder how Daredevil manages to "swing around" the city if his line is connected to the sticks in both hands, and it loops around in the air behind him like a plate of spaghetti?